There’s something to be said about having a little fun once in awhile. For us -- and you -- this could mean many things. Heading to the backwoods for a camping trip, hitting the beach to catch the waves, or having a blast with your friends at summer BBQ. It can also be the enjoyment you get when you customize your car, really making it your own. One way to customize your vehicle in a fun way is with ShearComfort’s unique seat covers from our Exotic Luxury Line. Not only do you get to transform your vehicle with fun patterns, you’re getting the ultimate high-end product, completely tailored to you and what you like. Exotic Seat Covers like our Alligator Seat Covers are one way to really stand out. People will notice these unique seat covers on your daily commute. More importantly, the fun croc pattern and color combinations make for a more distinguished and interesting custom interior. One that you can be proud of and show off to everyone -- even your fellow commuters! 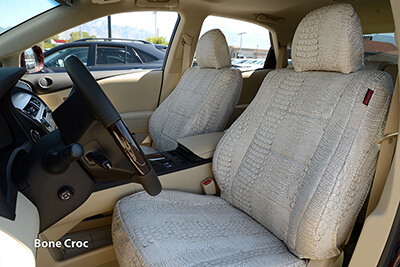 The unique crocodile/alligator pattern paired with the tailor-made nature of our Luxury Seat Covers create a perfect fitting product that will impress anyone who passes by. Customization is what our Luxury Line is all about. You have four different color options for the croc/alligator pattern. Choose from: Bone, Ebony, Java, Midnight and Flame seat covers Each one complementing different colored car interiors with each life-like pattern giving the appearance of alligator seats. Choosing the color of the alligator seats is only the beginning for our Exotic Seat Covers. We want to give you all the choices in customizing your interior. 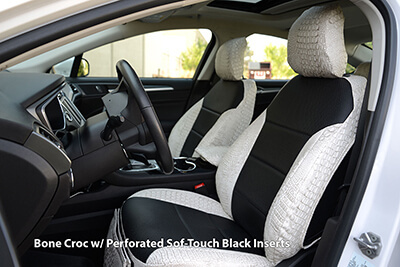 You can choose from going with solid alligator seats by selecting your favorite croc pattern or select from a variety of Sof-Touch Leatherette colors. You can choose to have the high-end imitation leather as the insert material or the outside trim fabric. The choices are endless when it comes to our Alligator Skin Seat Covers. In some cases too many options may indicate lesser quality. Fortunately, with our Luxury Line, the very opposite is true. You’re getting all of the options to customize your Alligator Seat Covers any way you want, combined with all the luxury. The three benefits of ShearComfort’s Luxury Line are: superior automotive grade material, superior fitting products made in the USA, and superior looking seat covers that transform you vehicle. 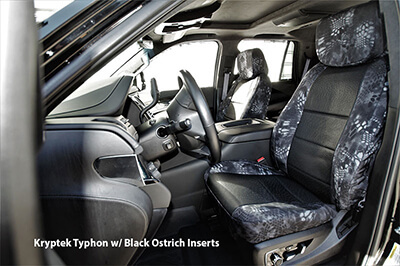 Ostrich Seat Covers are a conversation piece in your vehicle. 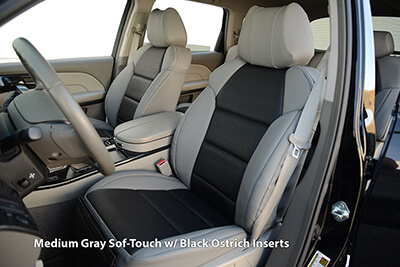 The unique ostrich pattern doesn’t just complement your interior, it completely transforms it. If you’re looking for fun car seat covers, these automotive accessories will do the trick -- ten times over. These unique seat covers come in four different shades. Starting from light to dark, we offer the funky pattern in Sandstone, Gray, Charcoal, and Black. There’s an appealing color for every customer and every car, truck, SUV or van interior. If ever in doubt, you can order samples to check out the different colors. We’ve saved the best for last. We talked about customizing Alligator Seat Covers with our Sof-Touch Luxury Line, but there’s another level of customization we’ve kept from you. One that takes the unique crocodile pattern and pairs it up with the funky ostrich pattern. Choose to have the ostrich pattern as the trim or the insert color, pick your favorite alligator seat color and put them together! This is true personalization of seat covers. Complete customization combined with a perfect fitting, high-quality product? You can’t ask for more out of an custom automotive accessory. Now that you know how to transform your car with unique seat covers like the Exotic Alligator and Ostrich patterns, it is time to start having some fun and customize. In the end, it is all about having a little fun!